This autumn we’re facing difficulties in feeding dry cows after a tough spring and summer. As a result, pregnancy toxaemia or Pre-calving Stress could be a problem on some farms. Maintaining a successful pregnancy requires a high amount of energy and if the cow is not being provided adequate nutrition through its diet, fat reserves can be used up too quickly and pregnancy toxaemia is a common result. This is especially a problem for cows having twins as there’s a much greater demand on energy reserves than a single calf. Very fat cows are also at greater risk of developing pregnancy toxaemia. During late term pregnancy the uterus and calf take up much of the space in the abdomen and leaves little room for the rumen to fill with feed, reducing the intake by the cows. Feeding low quality, poorly digestible hay or pasture only makes the situation worse as there’s no nutritional value in the feed. 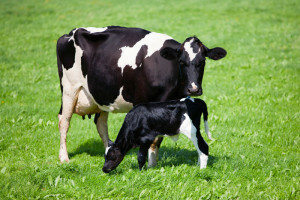 Cows affected by pregnancy toxaemia typically present as downer cows, although some show nervous signs such as a high stepping gait and mild aggression. Down cows are usually bright and alert and eating but cannot get up. Early veterinary intervention (within 24hrs) is important in giving these cows the best chance of survival and the greatest chance at saving the calf. Medical management ranges from oral or intravenous medication and possibly inducing the cow to calve. Preventative management of this condition involves lead feeding which helps make her body ready for the increase in energy required to support her calf in the last 2 months of pregnancy and the impending calcium demand due to lactation. Our vets are more than happy to speak with you about your herd to help you prevent loosing stock to pregnancy toxaemia on your property.